Ousted Philippine President Ferdinand Marcos and wife Imelda lived in exile in Honolulu. 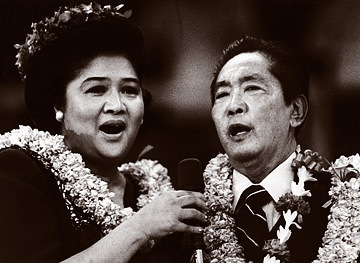 They are shown here in 1986 singing to supporters at an event at the Blaisdell Arena. Attorneys for more than 9,000 Filipino human-rights victims say they expect more delays in collecting $35 million in a brokerage account opened by former Philippine dictator Ferdinand Marcos. The Republic of the Philippines has indicated that it will file a petition asking the U.S. Supreme Court to review the decision by the 9th U.S. Circuit Court of Appeals last week rejecting the government's request to rehear its May 2006 ruling. "We're very disappointed the Republic of the Philippines is again going to oppose distribution of any money to the victims," said Honolulu attorney Sherry Broder about the attorneys for the plaintiffs. On Sept. 12, the appellate court affirmed a decision by U.S. District Judge Manuel Real of Los Angeles, who ruled in July 2004 that the Merrill Lynch account in the name of a Panamanian corporation, Arelma, should be turned over immediately to the plaintiffs. Marcos had opened the account in 1972 with $2 million shortly after declaring martial law in the Philippines. The $35 million represents just a small percentage of a $2 billion judgment awarded by a federal jury in Honolulu to the human-rights victims who either disappeared, were executed or summarily tortured during Marcos' regime, between 1972 to 1986. But the 9th Circuit, which referred to Marcos as a "rough and rapacious ruler who often exercised arbitrary power," noted that the symbolic significance of the award should not be disregarded, and it meant something to the claimants, many who are poor and live in rural areas in the Philippines. Some of the plaintiffs have since died and the rest have yet to see a cent of the judgment. Victim's representative Mariano Pimental, a former Hawaii resident, has since moved to the mainland to live with his children. Real already decided that an initial distribution of $2,000 be made to each of the victims, followed by future distributions based on whether they disappeared or the amount of torture they endured. The Philippine government has said that the money in the Arelma account belonged to the republic because it was obtained illegally and never belonged to Marcos. The Philippine National Bank, which held the shares of Arelma in escrow, maintained that the District Court did not have jurisdiction over Arelma. Attorneys for the Philippine government and the Philippine National Bank could not be reached for comment. Broder said other efforts to recover more of the $2 billion judgment are pending. The victims are challenging the ownership of real estate in Colorado and Texas that are under the name of a former Marcos crony, Jose Y. Campos. The 9th Circuit also affirmed the District Court's decision that the assets in the Arelma account were not derived from those taken from Roger Roxas. Roxas was a Philippine treasure hunter who claimed Marcos stole from him a golden Buddha, gold bars and bullion he allegedly found in tunnels north of Manila. Marcos died in Hawaii in 1989, three years after being deposed by a "people power" revolt. He had served as the country's president since 1965.